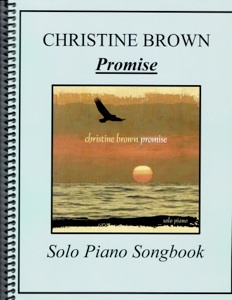 The Promise Solo Piano Songbook is the companion sheet music collection to Christine Brown’s 2011 recording by the same name. All thirteen pieces are included, and the scores are printed on a bright white medium-weight paper stock with clear, crisp print that is roomy and easy to read. And, the book is spiral bound! None of the music is overly difficult, but it isn’t super-easy, either. 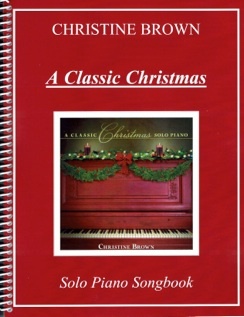 Pianists at an upper-intermediate to early-advanced level will find these pieces very playable, and more advanced pianists will love the expressive quality of the music as well as the beauty of the compositions. Pedaling suggestions are included, as are some of the metronome settings. All of the music is on the slow side with a very satisfying range of emotional expression. There are no reaches of more than an octave, and the key signatures are not overly challenging. I thoroughly enjoyed playing through this book and highly recommend it. 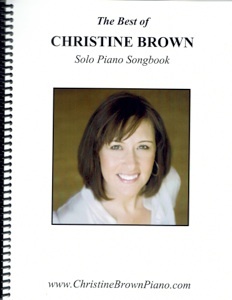 It is available in book form as well as downloads from www.christinebrownpiano.com. 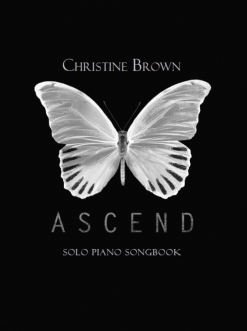 The pieces are listed below by title, what key(s) they are in, the number of pages, and the level of difficulty compared to other pieces by Christine Brown. Please note that a level 1 piece is the easiest of Christine’s pieces, not something for beginners, and a level 5 piece is relative to her most difficult pieces, not all music in general.